The expanse monastery grounds offer quiet places for reflection and relaxation. From the beautiful rose garden to the orchard, you won't lack your very own personal spot. The Labyrinth is a special meditative and prayer tool. It is not a maze, though it looks like it. A labyrinth has only one way in that leads one to the center and back to the entrance. Think of labyrinths as symbolic of pilgrimage; people can walk the path, ascending toward salvation or enlightenment. Modern mystics use labyrinths to help them achieve a contemplative state. Walking among the turnings, one loses track of direction and of the outside world, and thus quiets the mind. 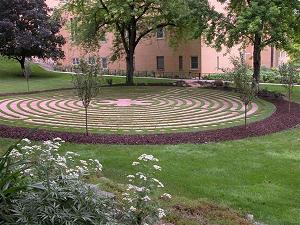 The Labyrinth on the Monastery grounds is meant for personal meditation and prayer. 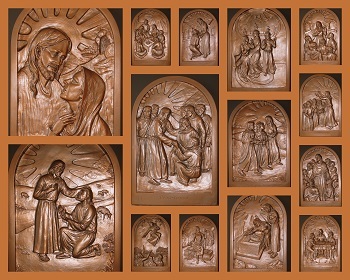 Most people have heard about the Stations of the Cross, also known as the Way of the Cross. A new addition to the Monastery grounds is the outdoor Stations of Light pathway. Stations of Light reflect on events of the Risen Christ, and covers Easter through Pentecost. They are a powerful way of reflecting on Easter. 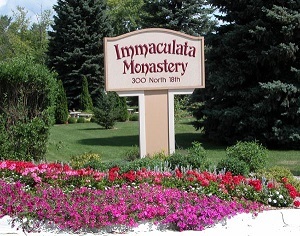 The Monastery grounds are beautiful and visitors are welcome to enjoy them. 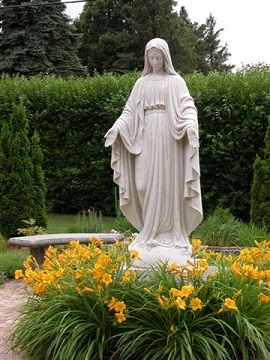 The Mary Garden offers a quiet place to stay with the Mother of Christ during private prayer or meditation. Don't miss out on your favorite walks ... praying with nature can be very relaxing! 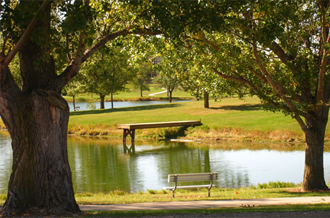 The Lake is a two-mile loop that offers opportunity for picnics, walking trail, and a refreshing view of nature.